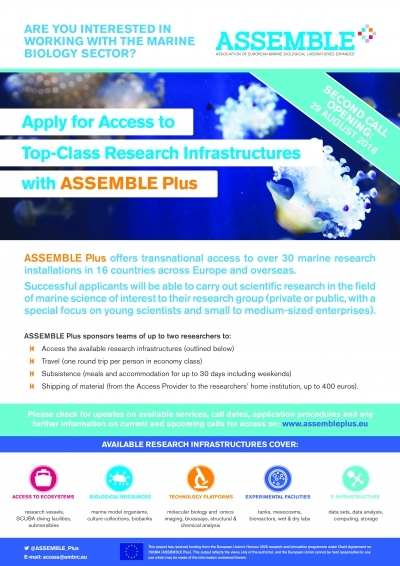 ASSEMBLE Plus is pleased to announce its second call for access to many of Europe’s key marine biological stations. The available funding will provide researchers with effective and convenient access to some of the EU’s most cutting-edge research infrastructures, ensuring continued advances in knowledge and technology. These research infrastructures include biological resources, facilities and data, which will benefit scientists from academia, industry and policy. In December 2017, ASSEMBLE Plus launched its first call for transnational access, awarding 50 access grants to researchers. In this new call, applications can be submitted at any time. . Successful applicants will have physical and/or remote access to over 30 marine installations including on-site or remote access to ecosystems, biological resources, technology platforms, experimental facilities and e-infrastructure. Applicants are invited to explore the research services on offer by the Access Providers. ASSEMBLE Plus will cover the costs of a maximum of two persons per project to gain access to labs, core facilities and standard disposables, for a maximum of 30 days. In addition, ASSEMBLE Plus covers the costs of the visit (travel, accommodation and subsistence) within certain limits and, in addition, can cover the costs of shipping biological material to the visitor’s home institute. Application submissions will open on 29 August 2018. Applications will be evaluated in six rounds, with the next collection date being 28 September 2018. Successful applicants will be informed within six weeks of the collection date. Fore more information on the call, eligibility criteria and the selection process, please visit the ASSEMBLE Plus website or email the Access Officer. Please click here to download and print the information flyer.